Growing up, I always heard that same question (usually connected to recounted tales of JFK’s assassination) and never quite understood the heartache a simple line of inquiry could implant in a person. On September 11, 2001 – at the tail end of my twenties – I suddenly learned with great gravity how hard a few words stitched together in just the right way could stagger a person. This was one of those days where I remember every minute in vibrant detail. I mean everything, every damned thing that I did that morning is tattooed to memory. Where were you when that day’s beautiful dawn broke? Where were you when you learned that the first plane hit? Where were you when that second plane made its shocking entrance on the CNN live feed? Where were you when YOUR world changed… once again? At 9:02 a.m. EST, as I was waltzing through our company’s Call Center (a little shortcut I had taken to my office on the way back from an early morning meeting with my boss’s boss), out of the corner of my eye I caught the 2nd plane hitting the tower and just stopped dead in my tracks. I had seen quick snippets of the morning’s earlier event replayed on the various televisions that dot the company floor plan. Each time I stopped for a spell to catch up on the event, my brain quickly comforted any rogue thoughts of anything untoward. Before it was merely an ‘accident’. Now it was unquestionably an act of war. I was in work a bit earlier that day (8:00 a.m.) to attend a meeting on behalf of my boss who was on the backend of her European vacation (an adventure which would extend by another week as she found herself a stranger in a strange land with no earthly means to just get home). I remember bemoaning the fact that I had to rise and shine a little too early that morning. And I remember chasing those bad thoughts away when I got to soak in a little of the September sunshine. Autumn has always been my favorite season – and though we were mere moments removed from August and the promise of Indian Summer always hangs high ‘til October – that morning’s bright rays cut through a swatch of September chill – sending me off to work with a little extra bounce in my step. Summer was fading. Fall was on fast approach. And I was two days shy of my one month anniversary at this new gig and still in the embrace of the new job honeymoon. When that second plane hit – when those smothered fears finally broke their chains and pushed to the head of all conscious thought – when suddenly I was whisked into meeting after meeting (from conference room to converted ‘war room’) as my company struggled to etch a plan of response, I knew things had changed forever. My employer, a technology company in the financial services arena, suddenly had a whole world of chaos to contend with the unprecedented multi-day closing of the New York Stock Exchange. Sprinting from meeting after meeting, I caught brief scraps of information and misinformation. A plane had crashed in a Pennsylvania field. The Pentagon had been attacked with rockets. Another rocket attack had occurred near the White House. The Sears Tower in Chicago was hit. Wait!!! It wasn’t rockets. The Pentagon was hit by a plane. ANOTHER PLANE!!! I didn’t know what to believe and what to discount. Regardless, what credible evidence did rise was enough to add up to one thing. My sense of security was shattered. I recall a random thought popping in my head within mere moments of that second plane hitting the second tower. This is just like that Clancy book, Executive Orders. And I was not surprised when I glanced at yet another monitor and caught the subtitles on CNN reporting that Tom Clancy was now speaking to the host by phone from his home in Maryland. The graphic informed viewers that in Tom Clancy’s novel Executive Orders, terrorists seize a plane and plow it into the White House. It’s a good thing Executive Orders was never adapted into a movie. Someone would have had Hollywood’s head. I also remember wanting to beat the living pulp out of this meathead who stood alongside me in a crowd of employees watching the towers burn on live TV. When the first tower began to collapse he turned and started laughing. That disconnect in him with what was transpiring a mere 200+ miles away and was irrevocably shattering lives across the globe – that fact that we were witnessing mass murder before our very eyes – made me, for the briefest of moments, want to disconnect every piece of that guy from the rest of him. Then, I realized, I’m better than that. And thankfully, so are a lot of us. But not all. But, I think what I remember most, was how beautiful that day began. I mean, it was a blinding blue September morn punctuated by that slight Autumn crisp. What started out as a storybook morning quickly morphed into a grim fairy tale with no apparent end in sight. 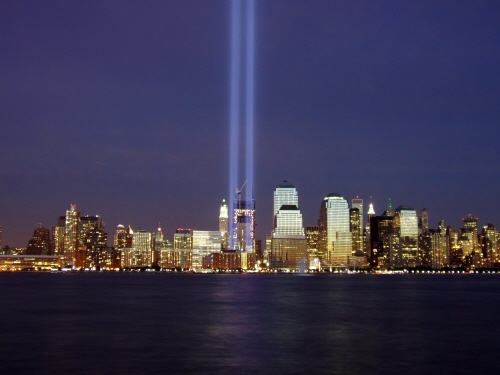 There isn’t a day that passes that I don’t wish September 11, 2001 had simply ended the way it began. There isn’t a day that passes that I wish none of us had to remember anything beyond a non-descript September day. When you think that the children who lost parents on 9/11 are still for the most part kids, you realize it wasn’t so very long ago. But the memory of it is gone for many and it is sadly one more sign of the disconnect people feel toward each other. I wanted to do this same thing yesterday and didn’t get to it. I just put up an aside to link back to my post last year. In my mind, there are only so many times I think you can write about this… probably just once, but you always want to remember it and revisit what you, and others, have written. That certainly was a “where were you when..” day. I also remember how bright it was. I got in the car (driveway faces east) and growled terribly about not finding sunglasses while starting the car. As the radio started up the announcers were all confused. The first plane had hit but they didn’t know if it was real, and accident or what. I remember the radio folks just sounding confused and chaotic. I quickly went back to the house – even remember getting caught in the seat belt in my hurry. Jay and the girls were in the living room. I blurted out about the plane and changed the channel – to much complaining from Mikayla (2 1/2) and Genna (1 1/2). Jay and I sat mesmerized as we watched the second plane hit and the none stop coverage. I don’t know exactly how long we were like that but we finally “woke up” when Mikayla said, “Mommy, I don’t like this movie, can we change it?” I still have a heard time leaving for work on 9/11’s. I was, of course, at work in the Plymouth Registry of Deeds, like every other weekday. I had heard on the radio the sporadic reports of a plane hitting one of the towers. As bits of news drifted in the morning, the second plane hit, fire raging, we kept checking back in the office downstairs that had a radio. Then Ron called to tell me that a plane had hit the Pentagon. Being raised in the Navy, that is the one that struck real fear in me. I could actually believe that TWO planes could accidentally hit both World Trade Towers, but hitting the Pentagon meant it was all an attack now. At that point, living the closest, I was sent home to get my little TV. I left and drove the 8 minutes home, grabbed my kitchen TV, just as the first tower fell. Being a completely calm and composed person in the face of calamity, this shook me to the core. I brought the TV in, where it stayed with it’s rigged antenna for the rest of the week. My daughter, who started high school with Columbine, began her senior year with this. Jason’s world view was shattered. I had no answers for either. Having grown up engulfed in the fears of the Atomic Bomb, the Cuban Missile Crisis, and the endless Cold War, I had some inner resources to draw on. Ever since the San Ysidro McDonald’s killings in the mid-eighties, I have instinctively scoped out an escape route for every single place I go into, but here, I had none. And there are moments that I don’t believe we have seen the end of this type of attack, but the 9/11 attacks have a size and scope to them that I don’t think can be repeated.My own next-event version is too frightening and too likely for these pages, I just go to bed each night thinking “It didn’t happen today.” So…I know where I was when I heard the news, and simply changed forever. Nice post Ed. I like you was working for a financial services company and first saw this on the TV’s we had set up in our call center, which was right outside of my office, a week before the attack. Before I heard what happened I just thought it was a fire. Then they said a plane had hit the building and there was much speculation. Then as we watch, we saw the other plane hit. Actually we just saw an explosion and did not what caused it. We quickly realized it was the second tower and then the TV showed the reply of the second plane hitting. We couldn’t believe it! Now of course as watched this we started to think, hey we are in high rise building in downtown Boston, right next to the Federal Reserve building. After a while as the towers continued to burned we learned about the Pentagon. Same as you we had meetings, the market closed and we sent everyone home. Not before accouting for employees who were traveling to make sure they were safe. The weirdest thing was taking the train home at about Noon and it was rush hour. Everyone let their employee’s go. Then getting home and watching it on TV for the rest of the day. The next couple of days were hectic to say the least as I was leaving for cruise that Saturday and was determined to go because I was not going to let the terrorists get the best of me and not travel out of fear of them. Not to mention I was planning getting engaged on that cruise and had purchased the ring on Monday 9/10 and was supposed to pick it up Friday. Each of the next two days our building was evacuated due to bomb scares and everyone was on edge. It was a truly scary time and I do make sure to reflect on day often, not just on the anniversary. I was working at a television relay station replacing a generator and transformer system in Dallas, TX. I remember being sent to keep watch at the top of the building because my foreman was apparently worried about where else planes might hit. It was a very hot day in Texas, and I was stuck up on the top of that building for a long, long time with no shade. It seems laughable now, the idea of Dallas getting flown into as well, but at the time my foreman was actually worried about the possibility of another attack and I was the most junior member of the crew, so I got sent to watch. I wrote this several years ago and publish it every year in tribute. When he was done, he came to me and said “Did you know that before I was born some people did something bad to a building?” – So, I figured out pretty quickly that they must have been talking about that at school that day. So, he and I had a little talk all about it. Then he showed me his project. He had essentially made a little memorial to hang on his door. It had the flag, the date September 11, 2001 – the Pledge of Allegiance – and a little reminder to himself to have a moment of silence on Sunday morning. You know – as a Dad – that just kind of knocks you over. After all, he wasn’t even born. He wouldn’t join a changed world for two more years. If he can pledge to never forget, I think the rest of us owe all those poor, unfortunate people who got trapped in such madness the same respect. Thanks for posting this again, Ed. I was at work that morning like alot of people and what is seared into my brain along with destruction I was seeing on the tv, is the feeling of how “far away” being at work suddenly seemed from home and my son at school, as I rushed to try to pinpoint where my family and friends might be on that morning, and hoped for everyone’s safety. God Bless America.